You have to check out Nellie Durand's Blog. I was blog surfing a few weeks back and came across Nellie Durand's blog. I e-mailed her to tell her how much I loved her birds. She immediately e-mailed me a pattern so I could make one. I was floored. Her generosity was amazing. She told me to make one and send her a picture. I was thrilled. I have been searching through some of my fabrics looking for just the right combination. I was on her blog today and noticed she now has the pattern and the instructions available for download. Check it out!!! She is also makes beautiful art quilts. Go over and check out her beautiful work. On the right hand side there is a picture of a bird and you can click to see her gallery. Oh the fun and creativity.....it seems never ending out here in blogland. It was pointed out to me that I did not indicate that I sell the Bendable Bright Lights. I am working on getting a link to my website from my blog. However if you click on this link you can go directly to the store. I believe I may have the lowest price on the internet for these lights. I have a Bendable Bright Light and I just love mine. I learned about them while on a trip to PA (I seem to learn a lot from going there!!) We all just had to have one and this is how I got started in business. I was reading a quilt magazine and saw them advertised as well. These lights really are as great as they look. The entire stitching area is lit up so you can see even on dark fabrics. If you have one and would be willing to share your thoughts about the Bendable Bright Light, will you please leave a comment in the comment section. Another cool thing I saw was a Thread Carousal. I've been in contact with a woman and we'll see if I get permission to post those too!!! Who will be my next guest artist? How about you? Just drop me an e-mail to IHaveANotion@yahoo.com and send me some pix of your work. I love to see new and interesting ideas. I find myself surfing blogs for hours mesmerized by all the creativity out there. I'm off to bed. Sweet Dreams!! On March 19th, Edyta Sitar (Laundry Basket Quilts) came to speak to the Gathering of Quilters in Toledo, OH. When she asked for volunteers to help hold up her quilts while she was speaking I jumped to my feet. Being 6 feet tall with long arms is an advantage when holding up quilts. I was able to see her work up close and touch all those lovely fabrics. Ohhhh I had a ball. I think I may have been drooling, eek. I got to chat with her husband while we held up some of the larger quilts. I suggested that perhaps after all this hard work I could select a quilt to take home.....I'm so glad he laughed....well....maybe not so glad....but it was nice that he had a great sense of humor. I could not believe how many quilts Edyta brought. There must have been 50 or more. Edyta's tallent is evident. I love the colors she has selected (did I mention she designs fabrics and patterns?) for her quilts. This was the first time I had seen batiks mixed with other fabrics. Every time I begin a new quilt, it is normally because of a person or event that has inspired me. Sometimes it can be for a loved one in need, birth of a child, a thank you or simply a tribute to a natural beauty that I have experienced, such as a lovely sunset. 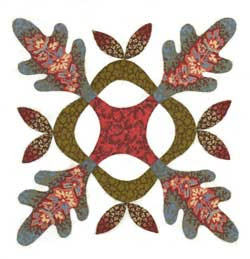 The first person that inspired me in quilting was my husband's grandmother - Anna Sitar. Her love and patience that was invested into quilts will forever remain imprinted in my mind. Great quilters have taught, inspired, and challenged me to develop a love for quilting and I hope to be able to share some of the beauty of quilting with you. 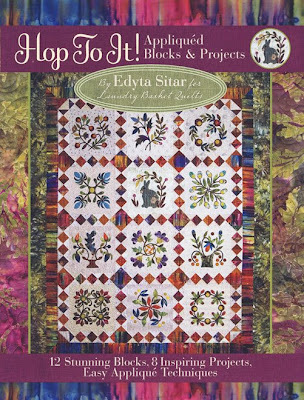 Available at: http://www.ihavea-notion.com/ along with many of Edyta's patterns. 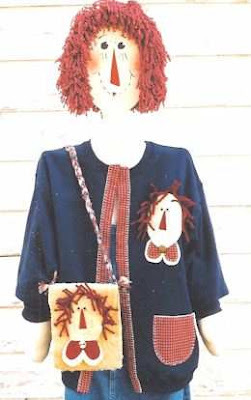 I plan to list all of her patterns however I have not had time to list them all in my store. If there is one you want and don't see it, please let me know. I've got to run cook dinner. I have had the worst time trying to figure out how to move photos around a blog. If you have expertise....please...PLEASE....pretty please e-mail me at IHaveANotion@yahoo.com so I too can learn how to move these pix aound. I will eventually find the time to google the "how to" about moving photos....but not tonight!! I have admired my girlfriends Dresden Plate quilt and miniature for several years. I finally decided to make a miniature myself. I started cutting out the pieces at a quilt retreat (2/09) in PA. I then lost my template. You may be asking yourself, "how did she loose the template." That would be the same question all 13 of us asked ourselves. No one could find it that weekend. We moved furniture and rugs and still never found the template. So Mary Jane sent me another one. I was hoping she would just send me her quilts and all I got was this picture!!! I asked Mary Jane if I could post it on my blog and she agreed. I'm thrilled to be able to showcase her work. 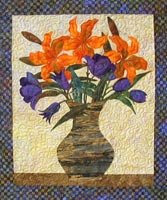 She does beautiful needle turn applique and hand quilting. Those are her two specialities. Her work is Blue Ribbon in my book!! This king size Dresden Plate quilt was made for my husband, Bill, who stopped at quilt shops for me while driving to and back from Pennsylvania to Oregon in May, 1998. Blue and yellow was just becoming poplar about this time and in some shops there was only a novelty print. I hand pieced the plates on another driving trip to the west coast. The plates were hand appliquéd to the back ground using the needle turn application and hand quilted. I was honored to win Viewer’s Choice at the Mountain Laurel Quilt Guild Exhibit, my local guild. The exhibit is on display for the whole month of September in even years at the Gmeiner Art & Culture Center, Wellsboro, Pa. I hope to get back to work on my mini Dresden Plate soon. I hope you don't have a stack of UFO's as high as mine!!! "I am a pattern designer and web designer www.sherlockdesigns.com. I taught elementary school for a number of years. I have no formal training as a designer or seamstress, I think I just barely passed home ec in jr. high. When I first started doing crafts I had no skills, just a desire to create. I took classes and tried every craft. I think the more you try and get away from the "I can't do that" mind set you are able to create. I used to say primitive was my skill level and now I say it's my style. If I am not creating something new or working on a project I am "not a happy camper". I believe God gave me the ability and the desire to learn, but unfortunately no "real" skills. There are so many things that I wish I could do much better, but I keep trying to learn more all of the time. 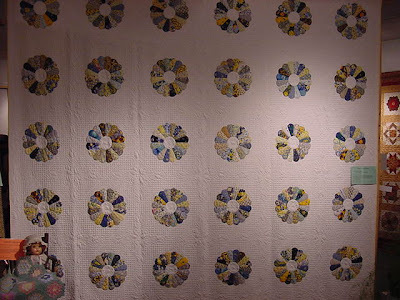 I changed my focus to quilts several years ago. My folk art quilts www.sonshineseedco.com are inspirational quilts with each quilt having a different theme. I combine primitive stitchery with tradition quilt blocks and rag quilts. 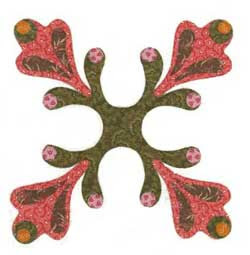 Most of my quilts and many of my primitive stitcheries have been digitized for machine quilting. I really like working with wool felt and making penny rugs. My newest patterns are punch needle and rug punch hooking. 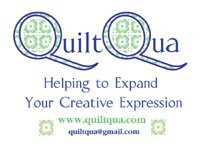 I am an exhibitor at several quilt shows each year. 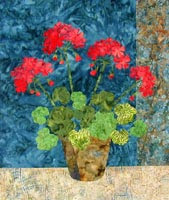 I demonstrate punch needle, rug punch hooking, applique with felt and rag quilting at every show. I have just started presenting programs for the quilt guilds. I have a few more websites http://www.oldecountrypeddler.com is the one I am developing now and it includes several different crafters." Time to hit the hay!! Well, here they are...24 total (some were duplicates so I did not include them in the photo). Bag tags that I promised to make for my friends who are returning to Japan. I had to finish them to get them in the mail to WA tomorrow morning. I thought they were very pretty. Jim and Chika picked out the fabrics from my stash. The majority of the fabrics came from Kathy Greene at http://www.fatquarterfactory.com/ I love the variety. Tomorrow I have to get working on a punchneedle project I promised another designer to complete. I was supposed to complete it by March 16th. But it is still in the works. I'll post pictures of the unfinished "work of tardiness." Since I have not quite figured out how to post the picture between paragraphs....I will just put it in the next post. Will there be a "Starry Night" tonight? 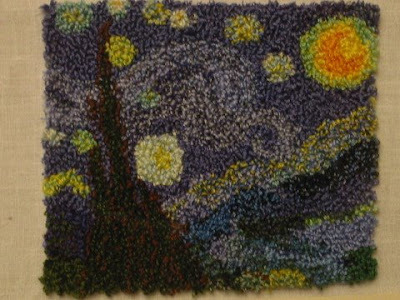 "This is my punchneedle interpretation of Van Gogh's Starry Night. It is about 5" x 7" in size. I used the photo from a small calendar for the basic design, and used a variety of embroidery floss colors. Most of the time I used three strands in a Cameo needle, with one strand of one color and two of another color. I enjoyed creating this piece as a gift for my daughter's college graduation in 2005, as I have her high school art project, a large chalk pastel interpretation of Starry Night, hanging above my bed. I'm a housewife from Chicago. I hook rugs, worked for a quilt shop for 15 years, and now have a full house after having an empty nest. Health problems suppressed my creative urges for a while, but I'm still finding ways to express myself. God bless you!" Lynnette also has a blog http://lynnettelarson.wordpress.com/. Isn't this a beautiful gift? Everytime I see work like this I want to improve my punching. I tend to over punch when I'm working on a piece. Progress not perfection right? RIGHT! Easter is on it's way and another group member commented about making a picture of Easter Eggs. Then I started thinking about what Starr had suggested....punching a picture a child has drawn. I am now thinking about having my boys draw pictures of Easter Eggs and punching them as gifts for their grandparents. All of these wonderful ideas. I have to get back to finishing my projects. I'll post a picture of all those luggage tags when I'm finished. I just found the neatest idea for re-using those cheap window blinds that get thrown out. Check out this blog http://littlegreennotebook.blogspot.com There are pictures of how to recycle those old blinds and use some beautiful fabrics. Oh my, I've got to go to bed before I go down to my stash and start carrying it around the house looking for windows cover. So March Showers Bring April Flowers? Hmmmm....I thought it was April showers bringing May flowers. I awoke to rain I was wondering who made the change to March showers. I guess this will remain a mystery, for today! Spring break is coming and if travel is in your plans you might like to see some travel accessories. I've posted a picture of some luggage tags that I made for a gift. My girlfriend, Mary Jane, taught me to make these simple little tags. She wanted to make some for her bags and she came up with this pattern on her own. Since I have learned how to make them I have noticed them in other places and on the web. I always find that interesting. The collective conscience of the universe delivers similar and sometimes the same ideas to many folks at the same time. These are pictures of the beautiful fabrics I bought yesterday. I offered to make souvenirs for my friends visiting from Japan. Well, to make 20 luggage tags a girl must have new and fresh inspiration. I know just where to go for that.... http://www.fatquarterfactory.com/ Kathy Greene, owner of The Fat Quarter Factory just so happens to live here in Perrysburg as well. I always leave feeling inspired to come home and start sewing. She carries all the new and fun fabrics that are not available here locally. Has anyone used the KaJinker? I saw one yesterday and wanted to buy it just to play with it. I'd like to see some embellished work if you have made anything with the KaJinker. If you don't know what one is, check out my website or google KaJinker. I'm working on more guest artists. I've been gathering photos .... stay tuned for more fun and beautiful creations by very tallented people. Thank You for all the wonderful comments on my new blog. Many people either phoned or e-mailed to tell me how much they enjoyed seeing Starr's lovely pin. How nice of all of you. I will be featuring another punchneedle artist soon. I'm in the process of gathering the pictures of her work. 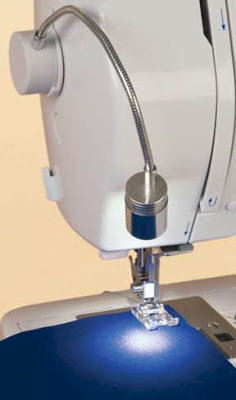 You can look forward to quilt projects and other hand made items as well. I have found that looking at other people's creations has inspired me to continue working my my projects or to try something new. That is how I started doing punchneedle. I saw another gal doing it and I was fascinated. It is so easy and I enjoy having a project to work on in the evening when I'm tired and don't have to "focus". The picture above is my work. 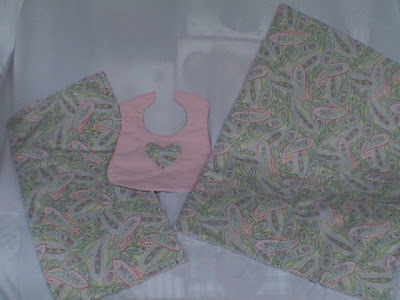 I agreed to make baby items for a Quilt Tea that was held in Covington, PA. I made an assortment of baby items including bibs with legs, blankets, burp cloths, and doll blankets. The Quilt Tea was a wonderful and fun event. I will publish more of that day and information in the coming days and weeks. My website is up and running. You can take a peak at http://www.ihavea-notion.com/ I have many more products to add to the site. My current focus is balance, so I will do this a little at a time. If there is anything you are in need of or interested in learning more about, please e-mail me at IHaveANotion@yahoo.com. This beautiful pin was created by Starr Burgess. 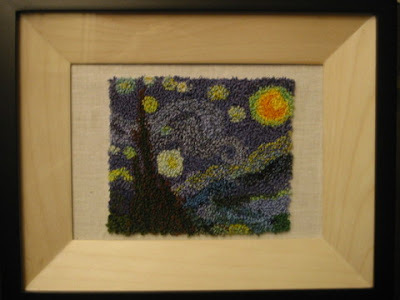 It was made using 48 colors of sewing threads with 2 different thread colors in the punchneedle at one time. Punching and changing one of the threads at a time to vary the color. 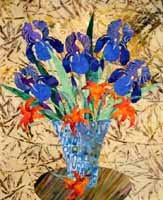 She has been an artist of many mediums for the past 40 years. Starr has done craft shows and taught many forms of art. She has done punchneedle embroidery for the past 20 years. "Punchneedle is a love that's easy for everyone to enjoy even when a person says they can't draw a straight line. In punchneedle, you don't need to draw a straight line....lol You can even take a drawing by your children and turn it into punchneedle winner!!" That is an excellent idea Starr!! 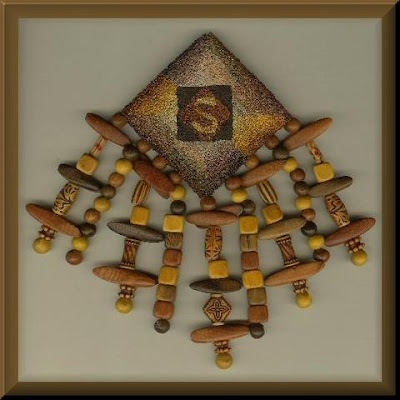 "There are many fine designers out in the market that do design punchneedle if a person is timid to draw their own images. I just get excited to see how people love the art of punching and the reward when it's finished. You can punch a design that only takes an hour or you can punch one that takes weeks....its all up to you. the main thoughts about punchneedle art work....Enjoy and Have fun Punching!!" Thank You Starr for being the first guest Artist on my blog. Your pin is absolutely beautiful and I look forward to having a private lesson!! To purchase punchneedle supplies just e-mail me at IHaveANotion@yahoo.com and I can have your supplies out the same day (usually). I am in the process of having some guest artists featured on my blog. I'm very excited to share their talent and enthusiasm. You won't be disappointed!! It is a beautiful sunny day here in Perrysburg, OH. I am looking forward to spring and flowers blooming. Speaking of flowers, Amy, from Perrysburg Flooring, has 3 acres covered with flowers and plants. I'm going to ask to visit to get some ideas for your yard. Her passion and therapy is gardening. I'm looking forward to learning more about plants and flowers for my yard. My new website is on it's way. Christine Hansen from http://www.momcart.com/ is doing my website. She is amazing and her talent is evident. Check out her site and you too will be inspired to have your website hosted by MomCart. I'm working on a punchneedle project using sewing thread. I can't believe how beautiful it is. Starr inspired me to try using sewing thread. I'll keep you updated. Welcome to "I Have A Notion"
Local pick up available. I will ship anywhere in the US at this time. Exact postage will be charged. Please e-mail me at IHaveANotion@yahoo.com for all inquiries.